The skin is the largest organ. We all need to take care of our skin, and in order for cats to be healthy and happy and have shiny, healthy fur, their skin needs to be taken care of just like ours. Many times, we can tell if a cat is healthy or ill just by looking at their fur. Is it dull and matted? Shiny and just enough oil throughout to make it full? Then you know your cat is doing something right! Sometimes cats need our help to keep their coat and skin in good health. Bathing them with product that is SPECIFICALLY made for cats is key. Brushing them helps to distribute the oil in their coat and make their fur shine. It also helps to stimulate the skin, and get rid of flakes, should they have dandruff. A good diet helps to keep their coat and skin healthy by providing necessary nutrients and vitamins to promote growth and luster. Vitamin E, as well as supplements located here, can be helpful in keeping your cat’s fur shiny and their skin healthy. For more information on how to keep your cat’s skin healthy and fur beautiful, here is a great article with good information on the subject. The article I will share is a great lesson to learn in observing your cat and their behaviors, patterns and general health. The lady in the case profiled in the article lead a busy life and had cats that were 10 years old. She noticed that there was more voiding in the litter box than usual, but attributed it to the fact that her cats were getting older and that it came with age. After a while, the excessive voiding started to bother her and she took her cat to the vet. Right away he was x-rayed and his blood was tested and found that his Blood Urea Nitrogen (BUN) was elevated and thus the thinking was that he had kidney function issues. He was dehydrated and was given fluid via IV. It was a difficult and stressful time for both the vet and pet parent. To read more about what happened click here. Also, here is an article that talks about kidney failure. I would not follow any of the advice on these articles before speaking to your vet and see what they say is a good plan of action for treating your cat. One of the take home lessons from this article is that if something seems off with your fur baby, a trip to the vet wouldn’t hurt just to rule out anything nasty such as this. August 24, 2012 – Bil-Jac Foods of Medinia Ohio has announced a voluntary dog food recall of a limited number of one of its dry products due to possible contamination with mold. 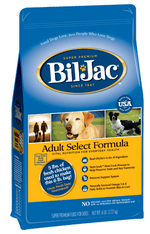 According to a company spokesperson, the recall includes only the 6 pound package of its Bil-Jac Adult Select Formula dry dog food with a lot code of 1792-02 and a Best By date of 27 December 2013. Since there seems to be a resurgence of warm weather, this recipe is sure to cool your pup down and make them happy all at the same time! It is very simple and quick to make as well. 1. Cook the meat of your choice and let it cool completely. 3. In a large mixing bowl, combine all ingredients until well mixed. 5. When ready, pop it out of the mold and serve to your pup! What is the best way to make sure my dog is receiving the best nutrition? By reading labels on your dog food and giving them a healthy diet with plenty of protein , some fats and very little if any, fillers (corn, wheat, gluten, etc)., and by giving them healthy treats you will be providing your dog with the best nutrition possible. My dog seems to have trouble rising in the morning (or they are limping) what could this be? Many times as dogs grow older, they will need to be checked for hip dysplasia, or arthritis. If this is an issue, there are many medications that can help an elderly dog. For more questions that are asked and the answers, click here. Diabetes can be such a scary diagnoses when you don’t arm yourself with information. If your dog receives this diagnosis, all is not lost. First we need to know how which dogs are more likely to get diabetes and what we can do to help stop this. As humans become more sedentary, sometimes our pets do as well. It is vitally important to keep your dog active by taking walks and playing, all dogs need exercise, some more than others. You will notice when treating your dog, you may use many of the same treatments that are being used on humans (insulin injections and glucose testing items). It is important to know that dogs who live with untreated diabetes can develop cataracts and eventually go blind. If you suspect your pet has diabetes, take them to the vet and get tested, as early detection is the best defense and can prolong the life of your loved one. As many people know, there have been many scientific studies as to having pets helps to curb depression with many individuals. Being a dog parent is no exception. For those of you who don’t know, you may be asking how can a dog help curb depression? Well there are several ways. The first is the unconditional love and bond that is formed with your dog. You leave your home and come back, your dog is always excited and happy to see you with a wag of the tail, maybe a happy and playful bark. This helps to form a connection, a social connection with a living being. We all need connections to live happy and mentally healthy lives. The next way a dog helps curb depression is exercise. Your dog needs to go out for one long walk or several walks/jogs/runs/swims per day. This gets you out of the house, into nature or out in fresh air at least, which helps lift our spirits and clear our heads. Another way that animals help depression is that just by petting your dog, that can help release endorphins, which, in simple terms, help to keep us happy and healthy. This also helps to lower stress and make us feel more like we can tackle our every day issues. There are many benefits that dogs have in our lives, read here to find out more ways that dogs help with depression. Of course this is not the be all, and end all. If you are depressed, it is recommended that you go and speak to someone trained to help, such as a school counselor, a therapist, social worker, psychologist, etc. This is something I saw on youtube and am teaching Isis how to do this. She pretty much has it down, but I sometimes have to remind her how to do it. It’s not difficult and I will explain, along with posting a link to one of the cutest cat eating from chopsticks videos ever! This is fairly easy to teach your cat. What you need are wooden chopsticks, patience and time, and some of your cats favorite treats. I actually use pork because Isis would probably do back flips in order to get some pork. The first step I did was make sure that Isis hadn’t eaten anytime before doing this trick. I cut up the pork into small treat size pieces. For the first day, all I would do is hold out the pork and have Isis take it from my fingers at her eye level. The next few days, I stood up and would raise the treat up a bit higher each time, until she was standing on her hind legs and taking the treat easily from my fingers (I would make sure that there was a 90% success rate. That is, she would take it from my fingers at least 9 times out of 10). All the while doing this, I would say the command word “pork”, so that she would associate that word with what she was doing. On the fifth day, I ended up putting a piece of pork into the chopsticks. I held the chopsticks up to the level where she would be standing on her hind legs and said my command word “pork”. She stood on her hind legs and took the pork from between the chopsticks. As promised, here is the trick in action. This is such a cute, smart cat!